Media Temple's Lissa Aguilar shares her top tips on wireframing, collaboration, and solving usability problems. 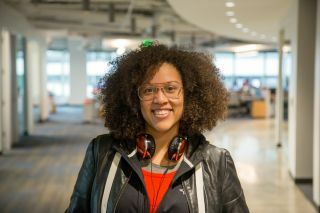 At Generate New York on 28 April, Lissa Aguilar will present the UX designer's survival guide. The conference will also feature 13 other great speakers, including Sara Soueidan, Mina Markham and Jen Simmons, and will be preceded by a day of workshops covering usability testing, frontend tooling, information architecture and design and content sprints. Get your ticket today! What do you do at Media Temple? As a user experience (UX) architect, I do user research and design solutions that address customers pain points on our website and our web hosting platforms. I work across multiple teams to help deliver a great experience to our customers. How do you investigate usability problems? Customer chats and calls are a huge resource. I’m also in constant contact with our customer service agents. They are our frontline and they have so much insight into our customers' evolving needs and workflows. They're a huge help with identifying those usability issues with our website or our hosting control panels. How do you decide how accurate a wireframe needs to be? I’d say it depends on two factors: the stage of the development for the product/feature; and the audience. I like starting off any project with sketching out a super rough wireframe of the page/control panel/ dashboard/ whatever it may be. Wireframes are used to focus the conversation whether it be about the requirements, the functionality, UI element placement, workflow, etc. As for the audience, some groups require seeing a hi-fidelity wireframe to get a good sense of the final product, while other groups are just focused on the functionality and basic layout so a low-fidelity wireframe is best for them during that planning stage. My faves are a pen and paper (for roughly sketching ideas and understanding the problem), Omnigraffle (for hi-def wireframing the layout and adding notes for the development team), InVision (for fleshing out the workflow and adding a bit of interactivity) and Framer.js (for more interactive prototypes). How do you collaborate with other stakeholders at Media Temple? I like getting all the people at the table that are involved in the project first - the stakeholders, marketing if necessary, developers and designers - to understand the problem we’re solving and identify any tech or design challenges. I’ll often meet with the stakeholders two to three more times to review sketches and wireframes and see the direction of the solution. Then a final kickoff meeting is held to plan out the execution and share testing plans. I make everyone my bestie during this process because we’re inconstant communication. What can people expect to take away from your talk at Generate New York? If you can't make it to Generate New York, there's also one in San Francisco on 9 June, which will feature Rachel Nabors, Aaron Gustafson, Stephanie Rewis and many other excellent speakers, covering adaptive interfaces, web animations, design systems, performance, prototyping and more. Meanwhile, early bird tickets for Generate London on 22 September have just gone on sale!